Have a New Year’s resolution to be more organized this year? An easy way to start is with your holiday clean-up. If you’re like me and have inherited ornaments you’d like to keep safe, a wreath, fun tchotchkes, twinkle lights, or any other seasonal fare, consider customized storage solutions to protect your items and make them easy to find again next year. Organize It All Holiday Light Storage Boxes – Hate tangled lights? Use spools to keep them manageable. 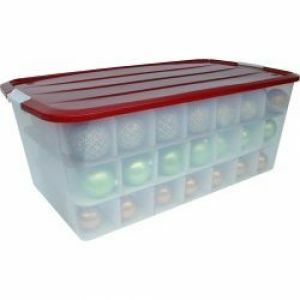 Iris Holiday Storage Bin with Ornament Dividers – Organize your baubles by color and see all your stuff in this clear bin. 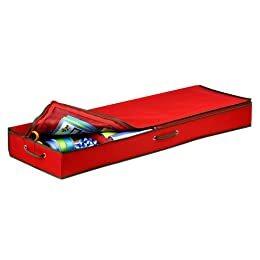 Honey Can-Do Wrapping Paper and Bow Storage Organizer – Low profile makes this easy to tuck underneath furniture in “Santa’s workshop,” wherever that may be. 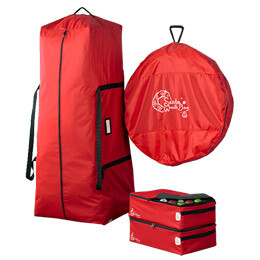 Santa’s Bag Collection – Heavy-duty, all-red suite of matching seasonal storage bags keep all of your items coordinated and tucked away until next year. This entry was posted on Friday, December 31st, 2010 at 5:17 PM and is filed under Organization. You can follow any responses to this entry through the RSS 2.0 feed. You can leave a response, or trackback from your own site.